The High Use Collection (HUC) contains course specific material placed under short loan conditions. These items can be borrowed by students, staff and affiliated staff of UNSW. Loans are limited to 2 items at a time. Items can be borrowed as 2 hour short loans with no renewals. Borrow and return items from the High Use Collection using self-check machines located in the High Use Collection room on Level 2 of Main Library and Ground Level of Law Library. High Use Collection items must be returned within the due time specified on the loan receipt. Returned items should be placed on the shelf next to the self-check machines in the High Use Collection room. 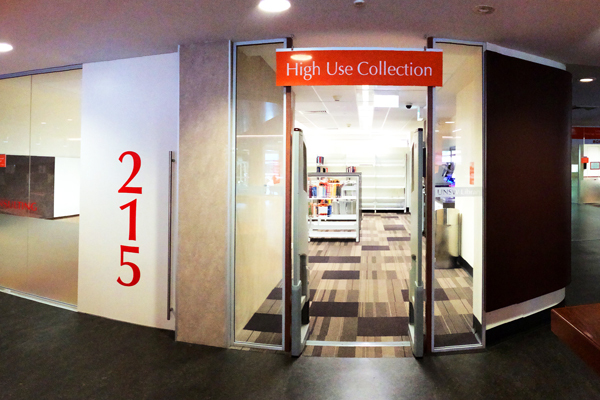 The High Use Collection is located on the Ground Level. Borrow and return items using the self-check machine near the Help Zone on the Ground Level. High Use Collection items must be returned within the due time specified on the loan receipt. Returned items should be placed in the returns chute at the Help Zone. Fines apply on an hourly basis for late return of High Use Collection items. You can borrow High Use Collection items 2 hours before the Library Help Zone closes. Return items before staffed hours the following day, using the self-check machines in the High Use Collection room. When the Library is closed, you can return overnight loan items via the after hours chute on Greens Road. Once the Library is open, return items using the self-check machine at the Help Zone.